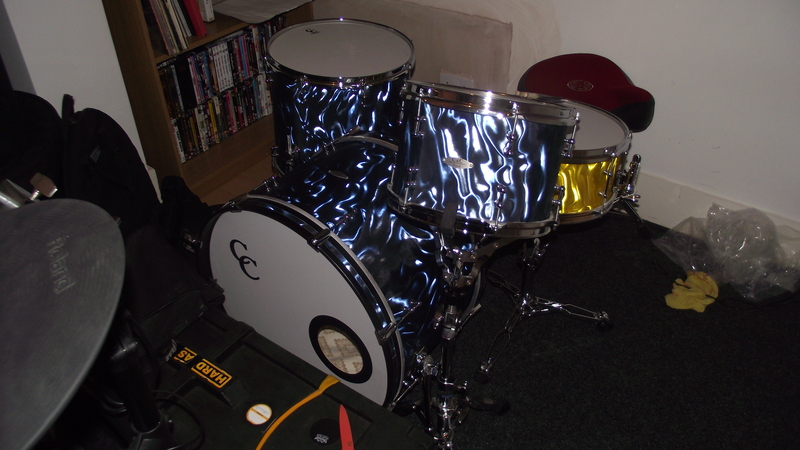 I have finally recieved my custom made drum kit from C&C in the US and have been able to put into practice the tuning knowledge I have gained so far. I have managed to get her sounding great and wanted to share a few findings that I have learnt in the last month or so of my tuning experiment. Firstly the main and most important fact I have learnt is that tuning is all about finding the sound you like. This is why it is sometimes called a ‘dark art.’ The best advice is to ‘trust your ears’, as drums are of an indefinite pitch therefore achieving a sound is different from person to person. Finding what sound you like at the start is hard enough, then you have to learn how to achieve that sound from the way you tune, and importantly what skins you use. There are many different types of drum heads but I now know that my personal preferred sound is achieved with coated remo heads. I have always used clear demo heads, pinstripes, but they give a very bright open sound which isn’t the sound I was striving for. I had been struggling to tune my old drums with these heads. Coated heads give more attack and have a mellow deep sound that I really like. In terms of the tuning process, seating all the heads on the drums properly is very important and something I had previously overlooked. From the prof sound drum tuning bible I learnt how to do this process properly. Please read the seating heads section for more accurate instructions. In a nut shell you need to finger tight screws until just touching the washers, back off a 1/4 turn, then 1/2 turns around drum (opposites) to 3 turns, then make sure the skin is in tune with itself. Finally, use a hairdryer around the bearing edge to seat the drums properly. You will hear a cracking of glue when it’s ready. This works!! Then I took the drums right back to no resonance, (from finger tight), 1/4 turn on each lug on the bottom and top, then another 1/4 turn on bottom skin lugs. This achieved a lovely drum sound for the toms and kick, and more importantly was the sound I have been trying to get. The top head is nice and lose so the feel of the drum is correct. This is also a really important factor as how a drum feels when you hit it makes a huge difference to the way you play and your overall sound. The only problem area is the snare drum as I am having real problem with snare buzz, when I hit the snare it produces a nice note, and sounds great together with the kit, but isolated the snares buzz for a long time after the strike. This week I shall be experiementing with the snare drum, beginning with tuning the drum with the snare’s removed first, then adding the snare wires and seeing if I can isolate the lengthy snare rattle. Previous PostPrevious I’m Running The Brighton Marathon for Charity, Please Sponsor me! Next PostNext Radio 1 Session with Sunless ’97 on Huw Stephens! People don’t realize what a science music is. There’s the mathematics of it, then the physical manipulation of the instrument. I used to play the trumpet from the age of 8. When I was 10, I switched to the French Horn. Nowadays people call it the Horn, but I’m not comfortable with that because so many instruments are horns. Anyway, I’m glad you are enjoying your new drums and I enjoy your explanation of how to become acquainted with you new instrument. Can’t wait to hear more! Thank you Russell for reading and I’m glad you appreciate the detail of playing a musical instrument, the more you learn the more you realise how much there is to learn!